Located where gray clouds conceal the sun and winds are strong enough to hinder even the strongest ships, lies Helheim’s Gate. 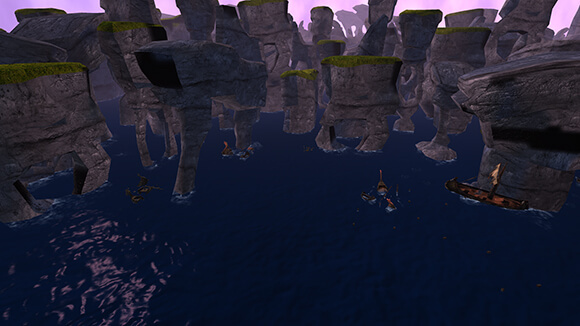 Dragons and Vikings must brave these dangerous waters before they can land on the shores of Dragon Island. Only those blessed with immense fortune by the gods can hope to navigate through the sea stacks that stretch upwards towards Asgard. To even attempt to pass through, it would take an incredibly talented and courageous Viking. If you think you and your dragon have what it takes, we encourage you to test your strength by making a journey out to Helheim’s Gate! To navigate through this passage, you’ll need a very special compass to get you through the rocky pathways into Dragon Island. By flying through the treacherous cracked sea stack and the depths of the salmon pools, you will eventually find yourself face-to-face with a massive wrecked ship. Tread lightly as you hear the creaks and groans of the ship barely balancing upon the sea stack. As you beat past the winds and swerve around sea stacks, remember that it’s not every day that a young Viking attempts to fly through Helheim’s Gate. The treacherous passes and hidden sun make it a challenge for any young adventurer, but a student of the School of Dragons is equipped with the courage and strength of Thor. Be sure to be on the lookout for danger, trust your compass, and use your training. Helheim’s Gate may be dangerous to fly through, but we know it won’t be impossible for you! I issue a warning to all Vikings wishing to travel to Dragon Island to think twice, for they must pass through Helheim’s Gate, the scourge of anyone wishing to pass through. My fellow warriors and I sailed three days from Berk, each one of us armed to the teeth with axes, shields and swords. Like me, they were tired of the constant raids and hungered to rid Berk of dragons once and for all. One night, we snuck out of our parents’ homes and sailed to the center of our troubles: Dragon Island. Our plan, I admit, was foolish. We were young and inexperienced, but we were filled with a longing for adventure. Perhaps it was for glory, but we went despite little Dagfinn’s warnings that we should wait for the adults to come with us. We didn’t even make it to Dragon Island. 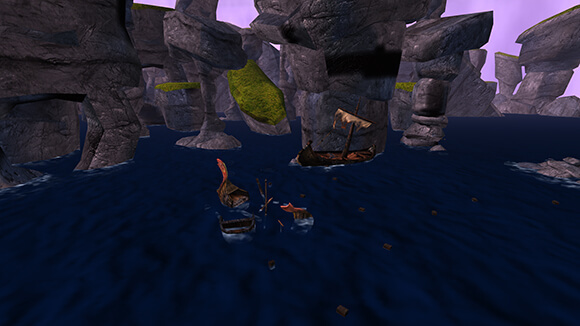 We had arrived at Helheim’s Gate and tried to sail our way around the sea stacks that seemed to touch the sky. How foolish we were to challenge the will of the gods! The wind was so strong, it was as if a thousand gods had sneezed in our direction, making it nearly impossible to sail forward or to steer in the direction we desired. As much as we rowed, we could not make it all the way through the passageway. And even so, there was the constant threat of the wind blowing us into the sea stacks and destroying our ships. After what felt like eternity, Rangvald suggested that we head back. “If Helheim’s Gate doesn’t kill me, my parents will if they wake up and find that I ran off!” he’d said, wringing his hands. “What are you? Some kind of coward?” I snapped, trying to keep the quivering from my voice, and to stop my hands from shaking. I wanted to object, to declare that we keep trying and push past Helheim’s Gate to Dragon Island. But I wasn’t stupid. Only the smartest and strongest Vikings could get past the maze-like passage. And it seemed like we didn’t belong to that group. As we turned the ship around, I kept my eyes on Helheim’s Gate, which slowly faded into the horizon as we sailed back to our village.